Our team is a carefully selected, highly –trained group, committed to providing you with the highest quality dental care. You can expect exceptional dentistry and unsurpassed customer service from the entire team. They offer numerous years of combined experience and can answer a broad range of questions regarding your dental care including communicating in several other languages including Spanish, Tagalog, Hindi, Vietnamese, Mandarin. Meet our team below! Genesis has been with Cosmetic Dentistry of Hayward since 2006, and is a Billing Coordinator and Scheduler. She is bilingual in Spanish, and is very helpful to many of our Spanish-speaking patients that visit the office. 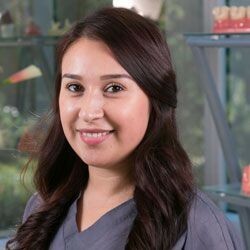 With the many years that Genesis has spent with the team, she has grown to develop great knowledge and experience in many various aspects of the dentistry such as chairside assisting and insurance. Some of her hobbies outside the practice include spending time with family and friends as well as traveling. 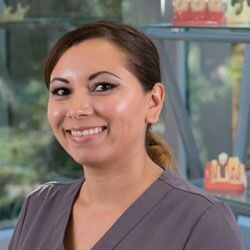 Karla is a Registered Dental Assistant with 12 years of experience in the dental field and 10 years with the Cosmetic Dentistry of Hayward team. She is bilingual in Spanish, and has expertise in CEREC, dental implants, and Invisalign. Karla’s love in caring for people allows her to build strong relationships with many of patients; thus making many of our patients’ visits to the dentist the best possible experiences ever. Outside of dentistry, she enjoys spending time with her family and daughter, and has a great interest in technology. Katina is our Dental Assistant, and she is fluent in Mien and highly demonstrates a great hard-work ethic. 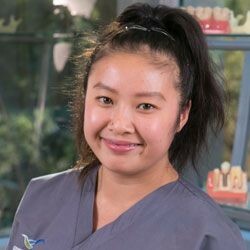 Since starting her career at Cosmetic Dentistry of Hayward in 2013, Katina has developed many great skills in dentistry. Her commitment to advancing her knowledge and skills with dentistry and technology makes her a great addition to the team. Outside of dentistry, she enjoys hanging out with her friends and shopping.